Final post from my wonderful Camino. On my last few days of hiking, my mind was flooded with the things for which I will always be thankful. I am now attempting to adjust to life at home. These are the thoughts I remember. They are in no particular order of importance and I know that I am missing so many things. My feet for walking and walking km. after km. after km. Hórreos – especially one being used. sunflowers with smiley faces and arrows. Albergues that had newspapers to stuff into wet shoes. Categories: Camino Frances 2014 | Tags: Camino Frances 2014, El Camino, end of walk, gratitude, life change, sharing, Spain, spiritual, stories, walking | Permalink. We had a wonderful hike to Lires. The ocean view was spectacular. We were so lucky to pass a horreo that was actually being used. The yellow arrows and shells we passed showed both ways because some pilgrims walk to Muxia first. The views of the ocean and the cliffs along the ocean were wonderful. We stooped along the way for fresh roasted chestnuts. The purple flowers were delightful. The local people always greeted us with friendliness. We stopped along the way to eat fresh roasted chestnuts at a locals place. Mary, Maureen, and I took a lovely walk along a path to the beach. We saw several rookeries of cranes along the way, but I couldn’t get a good photo of them. The shore line was spectacular. We spend a couple of hours just watching the waves crashing into the rocks. And just relaxing by the shore. We spent hours just watching the waves. I know we have a fabulous coastline in Oregon. I guess having walked 600 miles made this one really special. Our sunset in Lires was pretty spectacular. Our walk to Muxia was only 15 km. The path was a bit confusing and we first ended up on a ridge along the shore. It was such a beautiful spot. I was actually able to take this next photo with the timer on the camera. We got our Muxiana which is the special certificate for people who walk all the way to Muxia. The name Muxia comes from Mongia land of monks from the nearby 12th Century Romanesque monastice church San Xulián de Moraine. These monks came here in 1105 in an effort ot suppress the pagan rituals that were being practised at that time. Muxiá’s main claim to fame and the reason why it is so intimately connected to the Santaigo story is in the legend of Nosa Señora da Barca in Galician which is located in a very unique spot, right by the ocean, and believed to have been a sacred place of cult for villagers since pre-Christian times. It seems the locals weren’t an easy crowd to convince and convert to Christianity, as pagan rituals were deeply rooted and widespread. It may also be called Santuario da Virxe de Barca which stands on a rocky ridge above the surf. Legend has it Muxía was the landing place of the stone boat that carried Virgin Mary when she arrived in Galicia to help Saint James convert the locals. The granite stones you will find near the sanctuary are said to be the remains of the Virgin Mary’s stone boat: the sail, the helm and the boat itself. Since the 12th century, pilgrims on theCamino de Santiago have travelled further on after reaching Santiago de Compostela to pay tribute to Our Lady of the Boat in Muxía. The ‘remains’ of Our Lady’s boat are also known by other more popular names, and believed to have special curative powers (quite possibly dating back to before the Christianization of the area). The sail is the so-called ‘pedra dos cadrís’ believed to cure back ailments, rheumatic pains and even helping with fertility issues if walking under the stone nine times. The stone boat itself is the ‘pedra de abalar’, a rocking stone also believed to predict catastrophes and have healing powers. I can’t remember the story of this stone. I think it was cracked during a storm and has something to do with two lovers. This entire trip has been so inspiring. Much of the time I was walking over the past few days I have been flooded with thoughts about all the things for which I will always be grateful. I have much to process when I return home. We had views of the town below us. On our way back down we met a man who was picking Kale for his pigs. We couldn’t resist taking photos with him. We went to dinner, did our laundry and had a lovely sunset. Rose had to leave in the morning on the early bus. Mary, Maureen and I had one more day to spend in the Muxía area so we decided to take one more hike (sans backpacks) to another town outside of Muxía. It was a very enjoyable hike. Here are some of the photos from the day. We had a wonderful last day in Muxía. In the morning we had to catch the 6:30 bus back to Santiago de Compostela. Mary, Maureen checked into the Last Stamp Albergue and I left my backpack there. We wandered around Santiago for most of the day and then I had to catch the bus to the airport. Correction about the tree that I called a Monkey Puzzle: It is a Pino de Norfolk also called a Norfolk Island Pine. Last night we were able lo leave the door to the deck in our room open. That allowed us to hear the waves all night. In the beginning I could see stars until it clouded over. In the morning we woke up to the view of dark clouds over white clouds over the sea. We left our packs at our Albergue and walked about 3.5 km to the lighthouse at the end of Finisterre. By the way, The Romans gave this town the name of ‘Finis Terrae’, meaning Land’s End or The End of the World, as they believed this point to be the most Western corner of their vast Empire. I like the sculpture we saw on the way because I think it depicts a pilgrim walking in the wind. Near the lighthouse is where it is a tradition to burn your clothes. They prefer our not doing that because of the pollution so I didn’t burn a used pair of my toe socks. They are the only thing from my pack that I would be willing to leave behind. One more boot left behind. But we about 30 km. left to get to Muxia. We picked up our packs and met up with Mary and Maureen and had a great lunch. We were given a spacious room when we checked into the Albergue where Mary and Maureen were staying. The owners here are very sweet and helpful. We walked around town and had ice-cream cones and then dinner in that order, of course. Crossing our fingers for good weather tomorrow because we should be able to see the Atlantic along parts of our 13.5km. walk tomorrow. We started today without rain, just wind. I thought this was a Monkey Puzzle Tree, but I have never seen one with the branches going up from the wind. So it must be something different. We had a few views of the water and it almost felt balmy (18 Celcius). I wish I could show upload the video of the trees as the wind was getting stronger and stronger. Maureen and Mary are being blown around quite a bit here, but again, no video. Our views now reminded me of the Oregon coast. By the time we began to get close to Finisterre the rain had started again and the gusts of wind made it hard to walk in a straight line. I think our packs helped give us more weight so we weren’t blown off the path. Mary and I were loving it. I think the wind gusts were up to between 40 and 50 mph. How much more exciting than walking on a calm sunny day. Rose and I had reservations at the Hotel Naturaleza Mar da Adorable which had been recommended by a Laura from Portland who we both knew . Every room had a view of the sea. But it was raining and blowing so hard and we had no idea where it was. So we phoned them and they picked us up. Mary and Maureen went to find another Albergue. By the time we got settled in our room, the weather began to clear. This is the view from our room. 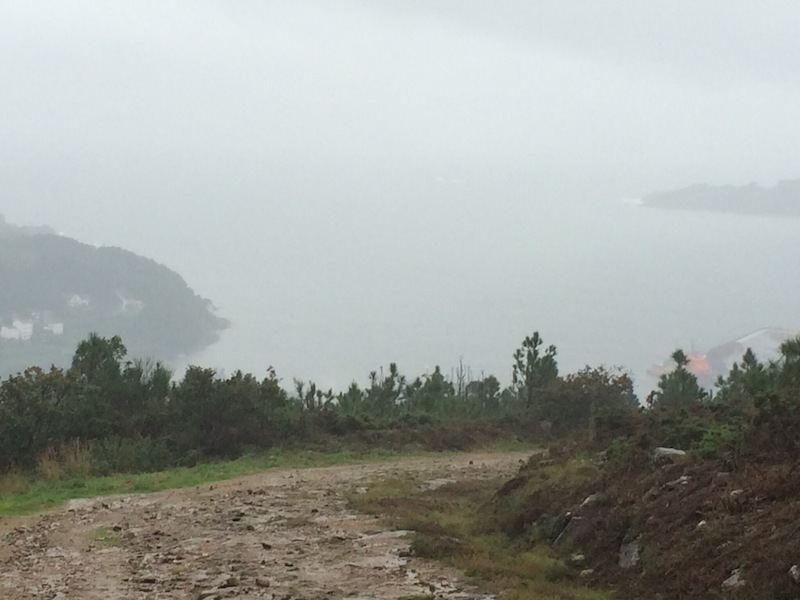 By 4:00 it was all clear and we walked to town to get our Finisterre Compostela. 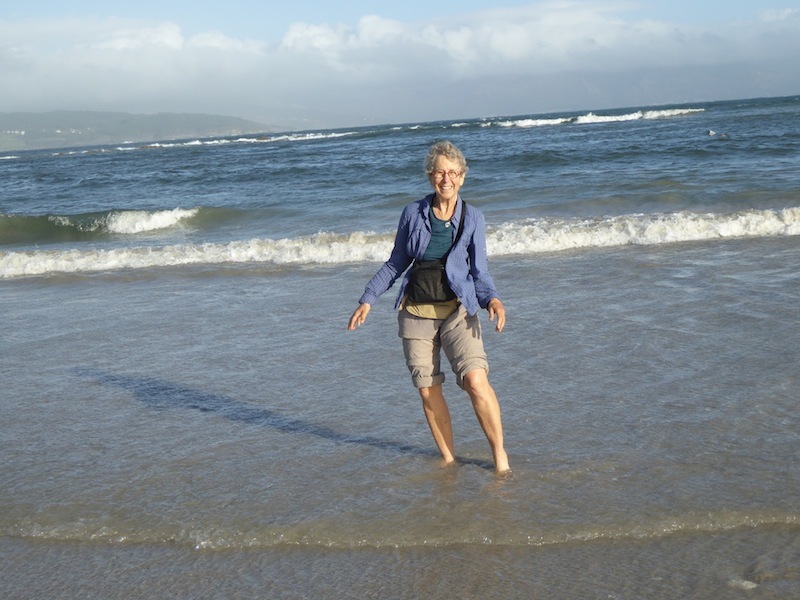 Then I went walking on the beach, collecting shells and walking in the water. I collected shells to bring home to my grandchildren. I had this great idea of putting one for each of them into a shadow-box with a note from me about getting them in Finisterre – the end of the world. Right after watching the sunset from our room Rose and I had our complementary tapas at the hotel. How delicious. We hope the weather in the morning is clear for our walk to the lighthouse. Categories: Camino Frances 2014 | Tags: Atlantic Ocean, Camino Frances 2014, El Camino, Finisterre, life change, sharing, Spain, spiritual, stories, Tapas, walking | Permalink. Over the last couple of days I have been wondering why after all these kilometers of walking do my legs and lungs still complain to me when we are going up hills? Of course we make it, but I would think that by now it would be easier. View of our Albergue room last night as we tried to dry out. After getting our clothes dry last night and taking the newspaper out of our almost dry boots, we took off again in the rain. It was not as torrential as yesterday for most of the day. But the paths were clearly wet in several places. Marian and Mary would find places to meet us. Tricky negotiating where to step. We crossed this part by holding on to the fence and stepping on the broken pieces of log near the fence. Today’s walk was suppose to have a view of the Atlantic, but that was not easy to get. And both the downhills and uphills were pretty tricky. It sure looked like we had a long way to go. We finally caught a glimpse of the water. And made it to Cee. What a great greeting from the hospitalario at Albergue de Casa de Fonte when he told us to take our shower first and then sign-in. He also gave us real sheets for our beds. They are so much better than the paper ones. Then he dried our clothes. Our boots are stuffed with newspaper. We have had a great dinner at the local restaurant. We have done our last hike that is over 18 km. I think the last 3 are under 15 each. Finisterre tomorrow. Then we found a fantastic sculpture of a pilgrim leaving his family. We could not find any plaque that identified who had created this wonderful sculpture. Mary and I took photos of a spider web. When we passed mile marker 65.04, there was a boot on top of the marker. I still have to take photos of old churches along the way. There was a man picking up chestnuts that had fallen from the trees after the hard rain. And another man picking Kale for his pigs. We passed several old stone Horreos. They are up on stands to, of course, keep animals out of them. Some people just store the corn under cover. We actually had a great walk. There were many hills up and down which was up to about 425 meters at the top, but many times up and then down and then up and down again, etc. we kept looking for a bar for breakfast. Finally, we reached Vilasserio after 13.2 km. Eggs and French Fries sure tasted good. We passed stone Horreos. We stayed at Casa Pepa in Santa Mariña. I loved seeing the 98 year old man who was asleep in the bar art Casa Pepe. I had a bottom bunk. I love the stone walls around my bunk. Mary and Rose relaxed in their bunks on the other side of the room. We woke up in the morning to rain. But all 4 of us (adventuresome women) decided to take a detour (3.8 km -round trip) to the Dolmen Perxuberia. It was erected 4000 years ago as a site of sacred ritual and worship. Brierley’s guide sure didn’t help much. We asked locals several times for help (rose knows a bit of Spanish. It was hard to tell if they were speaking Spanish or Galician. Even the man who spoke English really couldn’t help us. The book says that the Dolemen is located in the center a field behind a grove of trees on the far side of a young plantation and is often ‘hidden’ in briars. No wonder we didn’t find it. So we backtracked to the Camino and off we went. Again, there were no bars. It was pouring rain, sometimes sideways, sometimes in our faces. Occasionally the whole road was like a stream. Well, we had to experience that one day. Very hard to take any photos because of trying to keep the camera dry. We would stop in bus stop shelters to get out of the rain. It did slow down sometimes. Here are Marian and Rose -taken from a bus shelter during one of the lulls. 10.6 km more and we finally reached the edge of Olveiroa , pretty soaked, and we stopped at the first Casa Loncho Albergue – Hórreo, that had a washer and dryer. Yea! Getting our clothes done was quite a trip. The lentil soup was great and warmed me up. Rose and I left this morning at about 9:00. We walked through more eucalyptus forests. We met up with Maureen and Mary (from Georgia). They have both been carrying ashes of loved ones and leaving them along the Camino. It was foggy, but not raining. We did the 225 meter climb in 2.8 km from Augapesada to Trasmonte where we stopped for breakfast. We passed the medieval bridge (which has been restored) in Ponte Maceira. I still love the small villages and passing by a local man. And walking underneath stone bridges. We arrived at Albergue San Jose at the beginning of Negreira just before the real rain and hunkered down (all in bottom bunks).. Today was less than 10 km, but tomorrow will be about 21 km. We tried to go out to dinner tonight at about 6:30 because the rain had stopped. That was very silly of us. Dinner starts at 7:30. So we went to a bakery and a Supermarcarda. I bought a box of chicken soup mix, a small bag of pasta, an a small jar of pasta sauce. Made dinner in the kitchen at the Albergue.